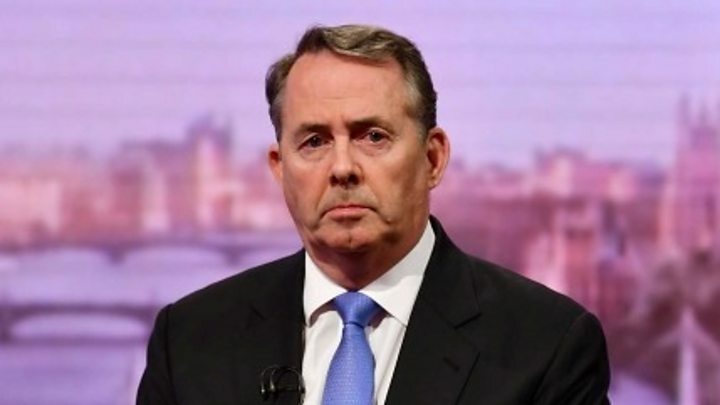 Media captionLiam Fox on Brexit delay: "If we have no option... then so be it"
International Trade Secretary Liam Fox welcomed a new offer from Tory Brexiteers as "a genuine attempt" to find "common territory". The Brexit-backing European Research Group has set out three tests it wants Theresa May to pass to secure its support for her deal with the EU. They still want a time-limit to the Irish backstop - but they say they don't mind how that is achieved. Mrs May has promised MPs a vote on her deal on or before 12 March. The three tests, drawn up by eight Brexit-backing lawyers, including Tories and a DUP MP, is seen as a softening of the ERG's previous stance on the backstop, which is meant to prevent the return of a hard border on the island of Ireland. They say it is up to Attorney General Geoffrey Cox, who is in talks with the EU, how he achieves an exit mechanism from the backstop. They had previously been demanding specific legal changes to the agreement. In private talks with Mr Cox, the ERG called for a legally binding mechanism to escape the backstop, with a clear exit route and an unambiguous rewrite of the language in the government's legal advice, according to The Sunday Times. Liam Fox told the BBC's Andrew Marr show: "I hope it's a genuine attempt - and I think it is - to try to map out common territory." He also sought to allay the fears of Brexit-backing Tories that Mrs May's offer to MPs of a vote on delaying the UK's departure - if her deal does not get through Parliament - could scupper Brexit. "To attempt to have a delay mechanism in order to thwart the process of Brexit itself is actually politically completely unacceptable," he told Andrew Marr. "And, as I have said before, would provoke a backlash amongst voters." He did not rule out a short delay to Brexit, even if Mrs May's deal gets through, in order to get the legislation through Parliament, however. The UK is due to leave the EU on 29 March, with or without a deal. MPs last month rejected the withdrawal deal Theresa May has reached with the EU by 230 votes - the biggest defeat for a sitting government in history. Mrs May believes the majority of the MPs who voted against her deal - including 118 Conservatives - would back it if she managed to secure changes that would prevent the UK being tied to EU customs rules indefinitely. She has promised MPs another vote on her deal by 12 March - and if that fails, she says MPs will get a vote on whether the UK should leave without a deal, and then, by 14 March, a vote on whether Brexit should be postponed for a short period. Sir Graham Brady, chairman of the influential 1922 committee of backbench Conservative MPs, said: "Most MPs are in a mood to compromise, but the danger of this backstop becoming permanent is a real one and it has to be tackled." Getting the backing of the ERG for her deal would be a major boost for Mrs May but would still not guarantee she could get it through Parliament. Some Tory MPs would prefer to see the UK leave without a deal, rather than the PM's deal, even with changes. And there are a variety of views within the ERG itself, with some leading figures taking a more hardline approach than others. Mrs May could find herself relying on the votes of Labour MPs from Leave-voting parts of the country, who are in favour of Brexit but want guarantees from the PM that workers' rights will not fall behind the EU after Britain's departure. Labour MP Caroline Flint told Sky News' Sophy Ridge on Sunday that given the choice between "an improved deal and no deal, we should seriously consider the improved deal". She said as many as 30 Labour MPs felt the same way, with even more against another EU referendum. "I think there is something like 60 or 70 Labour MPs who feel as strongly as I do against a second referendum," she said. Imagine Theresa May sitting with a calculator - trying to figure out if she has any prospect of winning the vote on a new deal she's promised in the next nine days. At first glance, it appears a near-impossible task - and yet today might allow her to indulge in some cautious optimism. Brexiteers have set out their terms. They're familiar and they won't be easy. But the PM knows what she needs to do to win over dozens in her own party. Add to that some Labour MPs - who want to deliver Brexit and have been offered incentives to get on board. The challenge is still a big one. The numbers are still against her. But the PM might, just might, think she has a chance. Labour has so far failed to get MPs to back its alternative Brexit plan, which would see the UK in a permanent customs union with the EU, and has now said it will attempt to get a new EU referendum. Shadow chancellor John McDonnell suggested Labour MPs would be expected to vote for an amendment calling for a referendum, when MPs vote on Mrs May's deal on or before 12 March. "I think on an issue as this we would see a whip, but also you've got to respect people's views and their constituency interests as well, and the whipping arrangement will be determined in discussion in due course," he told Sophy Ridge. Shadow Business Minister Rebecca Long-Bailey told Andrew Marr the Labour leadership would also continue to push its own Brexit plan and try to force a general election. Quizzed on what should be on the ballot paper in another referendum, she said it could be Theresa May's deal, "a number of other Leave options" and possibly Remain, but it would be up to MPs. Ms Long-Bailey added: "We are not looking to overturn the result of the referendum."